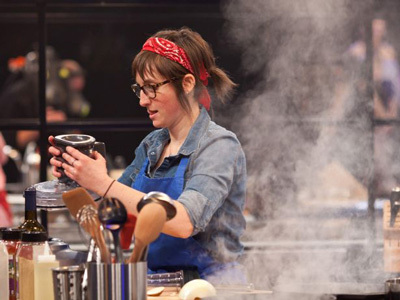 The 29-year-old senior associate of teen initiatives at the Jewish United Fund/Jewish Federation of Metropolitan Chicago was one of 16 home chefs selected to compete on Food Network’s newest reality cooking competition, which premiered April 13 and airs Sundays at 8 p.m. Hosted by Ted Allen of “Chopped,” last weekend’s pressure-cooker of a first episode saw the field of 16 cut in half, as contestants (competing in regions north, south, east or west based on where they are from) tried to earn a spot on their region’s team, each mentored by a famous Food Network chef: Michael Symon (North), Cat Cora (South), Alex Guarnaschelli (East) or Tyler Florence (West). For the first challenge, the mentors each chose a main course for their region’s home chefs to prepare in 30 minutes; they personally tasted each and determined which two of the four contestants would be on their team. Competing in the North region for Chef Symon, Goldfarb had to prepare steak and a side dish. She made a bone-in strip steak with red wine sauce and a side of potato latkes served with a horseradish sour cream. It doesn’t sound too hard, except when you consider that Goldfarb has long been a vegetarian. Still, she managed to impress Symon enough to earn a coveted spot on his team. Lucky for us, Goldfarb has agreed to check in with Oy!Chicago after each show airs to talk about the episodes and share her thoughts and behind-the-scenes knowledge. So stay tuned to see if she becomes America’s Best Cook! 1. Describe briefly your audition process for the show. What drove you to try out? Actually, a friend and colleague of mine at the Federation sent a link to me that advertised an open audition for the show. At first, I wasn't even going to audition because I was all intimidated by the process. It takes some chutzpah to put yourself out there like that! But after my partner and friends found out I was considering auditioning for the show, I no longer had a say in the matter. Essentially, it was "Goldfarb, if you don't audition for this show, you are an idiot." I couldn't argue with that. 2. What was recording the first challenge like? How was it like you expected and what were the biggest surprises? That first challenge was like one gigantic silly dream. I had thirty minutes, not only to cook an incredible meal, but to wrap my head around cooking for a freaking Iron Chef, in the Food Network Studios, against all these other phenomenal cooks, in a totally unfamiliar kitchen. I mean, who do I think I am? I think I looked pretty composed on camera, but inside all I could think was "do NOT **** this up. Do NOT **** this up. Keep it together, Goldfarb." I was surviving and really trying to soak it all up. I forced myself to look up from my cooking ever few minutes just to look around and consider my surroundings. This may have been my first and last shot at this experience, and I never ever wanted to forget it. The biggest surprise was when Michael Symon told me he wanted me on his team. Did you see that steak? It was DARK. I thought for sure I was going home. Turns out he saw something in me that I didn't. I will never forget that moment. 3. As the show’s “recovering vegetarian,” were you nervous to have to cook steak for the first challenge? Did you prepare yourself before the show at all to get comfortable cooking meat in a short amount of time? Before I left to film the show I spent about a month cramming all I could about meat cookery into my head. My friends were literally dropping off bags of meat cookbooks at my apartment for me to study. I have watched a LOT of food television in my time, and I know how these things work. Vegetarians never survive long, and are generally kept around for entertainment value only. So I read. And ate. I ate more meat in the weeks before the show than I think I ever ate in my life. It was actually pretty awesome because I was allowing myself to learn new cooking techniques and appreciate new flavors. But there is a difference between studying meat and cooking meat. When I walked into the steak challenge, I KNEW all there was to KNOW about technically cooking a steak, but I hadn't actually tried it in real life. Hence, the extremely, um, "blackened" effect on my dish. 4. You made latkes! What inspired that choice? Did you think at all before the competition started about including any traditional Jewish foods if you got the chance? Before I left Chicago for New York to film the show, I memorized a list of all the dishes that are special to me. Dishes that are either family favorites or that have become signature specialties over the years, and that I know I can cook and execute pretty perfectly. I knew that I would be thrown into some seriously bizarre and unexpected situations on this show, and I used the dishes on this list as a sort of lighthouse to guide me during any curveballs. A really significant portion of that list is Jewish food, like latkes. So when I learned I needed to make a steak, something I had never before cooked or ever enjoyed eating, I went right back to my lighthouse list and thought, "Ah. Latkes. Latkes will save me here." And they did. Chef Symon was all about them. 5. How did it feel to meet Michael Symon, have him try your food and then actually choose you to be on his team? 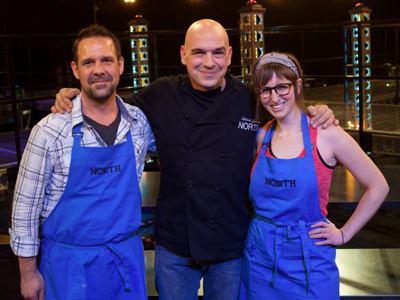 When I learned that I would be cooking for Michael Symon and competing to be a member of his Team North, I experienced two things: 1) a giddy fangirl mega-crush come-true and 2) a terrifying, crushing, self-defeating pit. I'm pretty confident in my cooking skills, but I was standing before an Iron Chef meat master. I was intimidated, but I also couldn't get cooking fast enough. I knew that this was a once-in-a-lifetime opportunity and I was absolutely committed to making the most out of it. I knew that if I could get onto MIchael Symon's team, I would have the chance to really, REALLY be mentored. I knew nothing from meat cookery, but I really wanted to. If there was ever going to be a chance to learn from a master, this was it.